It’s more than just plopping one foot in front of the other. For running enthusiasts, the activity is an all-encompassing life philosophy. More than a physical pursuit, running is beloved for the states of mind it can create: from brain-flushing clarity to a heightened sensitivity to the present moment and even as a quest for self-knowledge, running could perhaps be considered one of the most existential of athletic pursuits. These abstract concepts are given full form in 5 fascinating films about running, and you can watch all of them on NFB.ca. From the poetic vintage short Runner by the great Don Owen to the dark and intense 2013 drama by the bright young Quebecois filmmaker Chloé Robichaud, running is explored in detail through the magic of cinema. Let’s take a tour of the films! Writer/director Chloé Robichaud received a five-minute standing ovation at the Cannes premiere of her 2013 film about a young woman whose love for long-distance running seems to be a crutch for her confusion about everything else in her life. 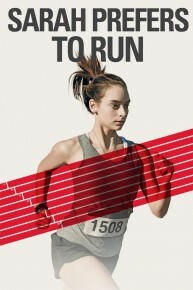 In Sarah Prefers To Run (Sarah préfère la course), 20-year-old Sarah agrees to enter into a marriage of convenience with a friend in order to receive financial support that will help her pursue her athletic goals in an elite post-secondary running program. But it seems her clear-minded dedication to her sport doesn’t extend to much else in her life: she must face tensions in her relationships with her mother, her ersatz husband, her running teammates, and even her own body and mind. What ultimately emerges in Robichaud’s deliberate and introspective film is a portrait of a young woman with great potential, dedication, and desire, but very little certainty about the direction in which she’s headed. Sarah is a strangely closed-off personality It’s to the film’s credit that we can reflect so much on a complex young woman who reveals very little about herself. Watch the trailer, and then rent the film on NFB.ca. Do you know the story of Harry Jerome? In the early 1960s, the Vancouver-born sprinter was Canada’s best hope for Olympic gold. But a ravenous media frenzy and physical injury interfered with Jerome’s upward trajectory, eventually creating a saga of the rise, fall, and redemption of Canada’s most record-setting track and field star. Painted with the racism of the time, media coverage characterized Jerome as undeservedly self-important and called him a “quitter” when physical injury threatened his performance on the world stage. 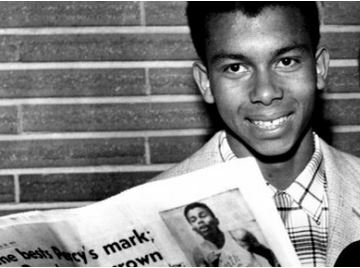 In interviews with Jerome’s family, friends, and athletic peers—including celebrated Canadian long-distance runner Bruce Kidd—Mighty Jerome reveals the story of a racialized athlete struggling to be recognized for his accomplishments during the civil rights era. Watch the trailer, and rent the film on NFB.ca. Director Lori Lewis takes a unique approach in this film about racial injustice at the 1967 Pan Am Games. Constructed as a “memory play” narrated by the main character Thomas, Frontrunners tells the story of ten young men selected to run over 800 km bearing the Pan Am torch, nine of whom were from residential schools. Upon arriving at the Pan Am Games stadium, the runners were denied entry with the torch, and a non-Aboriginal runner was given the honour of bringing the torch in to the opening ceremonies. Expunging painful and often disturbing memories, this film looks closely at the segregation and oppression of Aboriginal athletes by a colonialist society and the despair and abuse they suffered in the residential school system. Still, the film injects a dose of celebration into its sombre themes: ultimately, Frontrunners is a story of survival, hope, reconciliation and a dream for a new beginning that transcends hatred and racism. Watch Frontrunners on NFB.ca now! This luminous and hypnotic short film is nothing less than a sublime meditation on the awesome power of the human body. Running long distances on his seemingly tireless legs, Bruce Kidd demonstrates a kind of supernatural focus that any athlete aiming to get to the top of their game would love to adopt. (Kidd went on to become a respected academic and administrator in sports education; he recently retired from the position of Dean of Physical Education and Health at the University of Toronto). The film is accompanied by poetic narration from the great Anglo-American poet W.H. Auden. Director Don Owen and cinematographer John Spotton use long takes and tracking shots to immerse viewers in a kind of mesmerizing out-of-time experience as we follow Kidd’s tracks. If there’s any film that replicates the experience of long-distance running through cinema as closely as possible, this one is it. Check out this cinematic gem now. It’s FREE to watch on NFB.ca. I’ll Go Again: what does it take to get to the top? In this sporty documentary, a group of Canadian athletes—a kayaker, a gymnast, a pentathlete, and basketball players—prepare for the 1976 Olympics. Their goal? To make it to the podium. But exactly what does it take, and is it worth the effort? Pentathlete Diane Jones is the runner in the group: she practices sprints and hurdles with laser-like focus. At 15:29 in the film, you can see an impressive burst of energy as she speeds past her competitors in a hurdles race and crosses the finish line with aplomb. But in her final race, at 36:10 in the film, she comes up unfortunately short. There seems to be no way to maximize the videos when you embed them. At least link to the videos in the text (I’m talking about the free ones) so that we can find them to watch full screen. The feature film Cold Journey (1975) started out with the best of intentions but failed to find its audience in commercial cinemas. It scored much better in community screenings throughout the country. This is its complicated story.